5 September 2015, Singapore – To aid communities affected by recent widespread floods across Myanmar, Panasonic Asia Pacific, along with its Group Companies in Singapore, has donated approximately S$33,500 to spur relief efforts in the afflicted nation. Funds are primarily being channeled through Japan Platform, an international emergency humanitarian aid organisation that offers the most effective and prompt emergency aid in response to natural disasters and refugees’ situations worldwide. Some of the funds are also donated to the Red Cross Singapore. 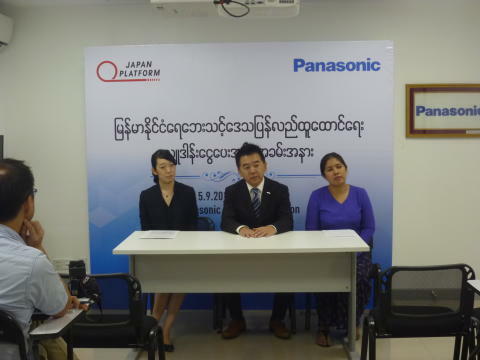 In addition, Panasonic also started an Eco Learning Programme (ELP) to help educate youths on the impact of climate change and what can be done to protect the environment as part of disaster risk reduction. On 12 August, the first session was conducted for around 50 children aged between 10 and 15 years old at the child nurturing facility “Dream Train” in Yangon, where they explored a diverse range of eco ideas including eco-living and eco-technology. The ELP is a global programme that started in August 2010 which aims to provide eco education to children around the world to help nurture global sustainable leaders of tomorrow. This is not the first time that Panasonic is aspiring to improve the lives of people in Myanmar. As part of Panasonic’s 100 Thousand Solar Lanterns Project, over 7,000 solar lanterns have also been donated over the last 3 years to 9 societal organisations working to address various social challenges in the country. Feedback towards the utility of the Solar Lanterns have been extremely positive, with recipient organisations highlighting how they have helped to significantly improve working conditions in hospitals and schools. Based in Singapore, Panasonic Asia Pacific regional headquarters focuses on creating A Better Life, A Better World by promoting its Business-to-Business portfolio while maintaining solid Business-to-Consumer growth. The region has 40 manufacturing sites, supporting Panasonic’s global production activities in the housing, agriculture, energy solutions, appliances, components and devices sectors.